5G stands for the fifth generation of the next wireless mobile standard. First of all, 5G cellular technology is dangerous because it emits Radio Frequency (RF) Radiation. And it does so at ultra high frequencies and with ultra high intensity, compared to earlier technologies. The World Health Organization classified RF Radiation as a possible “carcinogenic” in 2011. There are literally hundreds of peer reviewed scientific studies linking RF Radiation to things like cancer, crib death, DNA damage (especially in infants and fetuses) and male infertility. Also, because of the limits of the frequencies used, for users to have good reception, it is estimated they will need to put a mini cell station every 2 to 8 houses. This will multiply significantly the amount of RF Radiation we will be exposed to. KEEP DISTANCE– Keep your cell phone as far from your body as possible. Carry it in a separate bag instead of your pocket. Keep it away from you when you sleep at night. MEASURE THE EMF – Identifying the location and severity of 5G radiation levels on any regular journeys you take, will help you to modify your route to avoid these sources. BUY EMF SHIELDS – There’s quite a big range of products you can buy to minimize or neutralize 5G radiation emitted by your phone. PROTECT YOUR HOME - In your home, unplug Wi-Fi enabled devices when not in use. Keep your bedroom clear of phones and other devices that are running on 5G networks and frequencies. DIET– Radiation Increases the level of free radicals in your body. Eat foods that have a High Oxygen Radical Absorbance Capacity (ORAC) to combat free radicals and radiation. EARTHING– Walking barefoot removes any electrical charge in your body and equalizes you with the Earth’s electrical frequency. This way you earth yourself and limit radiation exposure. This could be fun this spring and summer! 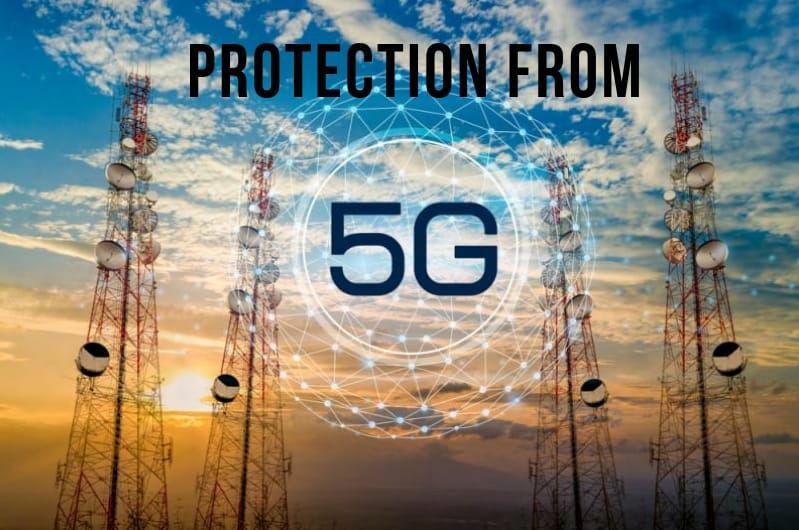 EDUCATE YOURSELF– One of the best ways to avoid exposure to 5G radiation is to educate yourself on the most common sources, the extent of risks to your health, an the best measures to prevent this and protect yourself. Here's to your great health!